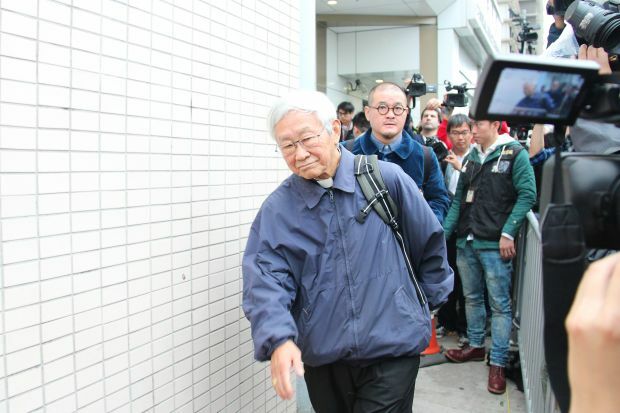 HONG KONG (CNS) — Cardinal Joseph Zen Ze-kiun, retired bishop of Hong Kong, joined the civil disobedience movement organizers who surrendered to police Dec. 3, with a hope to end the present occupation campaign that has lasted more than two months. Cardinal Zen remained at the police station for an hour. As he left, he asked people to pray for democracy in the city. The Occupy Central movement, a civil disobedience campaign to block roads in central business area, was initiated by Benny Tai Yiu-ting, an associate professor of law at the University of Hong Kong, and the Rev Chu Yiu-ming, a Baptist pastor, in an effort to force the Hong Kong and Chinese governments to allow true democracy in the city. The protesters feel government authorities have handpicked candidates for the 2017 election of Hong Kong’s chief executive. The cardinal, 82, is a supporter to the Occupy Central movement. Last June, he launched a walking campaign, walking 52 miles over seven days in different areas in Hong Kong, to ask more people to join an unofficial referendum on democratic reforms. Benny Tai also turned himself in to police Dec. 3. He told reporters after he left the police station that it was time to promote civic education in different platforms, instead of continuing the occupation, as insisted on by the student group. Recently, protesters and the police had clashed violently. Many academics said police used excessive force to clear the roads.